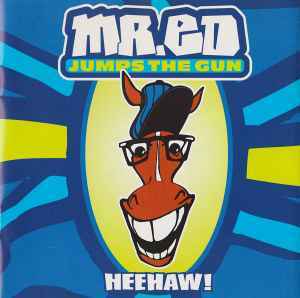 Mr. Ed Jumps The Gun ‎– Heehaw! Recorded at Vielklang Studios, Berlin. Mixed at Tritonus Studio, Berlin. Track 1 published by Cotillion/R.Mellin Musikverlag. Track 6 published by Lowery Music/Discoton. Comes in a generic jewel case with clear tray and 8-page fold-out inlay. On the disc track 15 is actually part of track 14, which consists of "We're Mr. Ed", lasting for 1:13 before 1:38 of silence followed by "Ed Rider", lasting 0:56.